In just a couple of weeks comes one of the most cherished holiday of Christianity – Easter. Every year this special holiday brightens up our homes with its exciting traditions and customs. Surely, one of the most loved among these is decorating the Easter eggs! What do you know about the tradition of the brightfully colored Easter eggs? Easter is known to have deep roots in the Christian religion, and the painted eggs symbolize the drops of blood of Jesus Christ shed at his crucifixion. That’s why in the past all Easter eggs were painted red only. Using various colors and applying various dying techniques in our days is the result of people’s infinite creativity and love for art. Yet, Christianity is one of the youngest religions on Earth. Would you be then surprised to learn that the practice of decorating eggshells is actually ancient, and predates Christian traditions?! The oldest painted eggs date as far back in time as 60,000 years ago and were found in Africa. Ostrich eggs decorated in gold and silver were part of the burial ceremonies 5,000 years ago in the lands of the ancient Sumerian and Egyptian civilizations. As a matter of fact, many cultures and religions around the world have ancient beliefs that the world was once born out of an enormous egg, and these peoples have ever since used the egg as the symbol of new life, re-birth and new beginning. But enough of history and religion! You must be already impatient to learn how to make marbled eggs. As the name suggests it, marbling is an artistic technique of transferring the amazing beauty of the marble stone colors and patterns onto any other material, be it fabric, paper or, as in our case, eggshells. Don’t be alarmed! 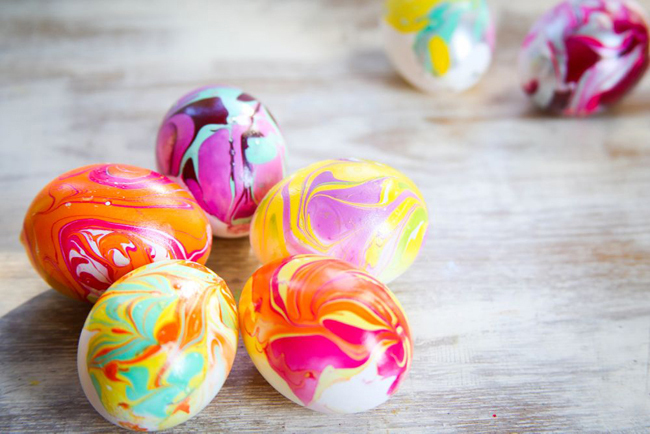 Marbling Easter eggs doesn’t require any special artistic talent, just your creativity, attention and patience! In this course we are going to show you three popular marbling techniques, using standard liquid food coloring and nail polish. Once you have prepared it all, you can “play” for hours and have the most amazing marbled Easter eggs! You also need to decide whether you are going to marbleize hard boiled eggs or just empty eggshells, in which case you’ll need the needle and the egg blower. In case you wish to prepare colorful Easter eggs as decoration items, you’ll need empty eggshells only. Using the needle carefully pierce a raw egg at the top and the bottom. Try not to crack the shell and insert the needle deep enough so as to puncture the yolk. Then, using the egg blower, empty the egg. If you are to marbleize whole eggs, just make sure they are hard boiled and not cracked. Prepare as many eggs/empty eggshells as you wish (1 or 2 dozens will be enough, though) and place them carefully aside. Take care that they don’t roll over, fall and crack! In a deep bowl, mix 3 cups of warm water, 2 tablespoons of white vinegar, and 10 to 20 drops of food coloring, depending on the intensity of the color you wish. Naturally, you’ll need as many such bowls as many colors you wish to use. Place an egg/eggshell in the mixture and leave it until it takes the color on. From time to time, use a spoon to gently turn the egg in the mixture. Eggshells are light and will float. Press them gently with the spoon so that they stay submerged in the mixture. When you are satisfied with the color, take the egg out of the bowl and place it onto a dry paper towel. Leave it to dry. • For achieving better colors, use eggs with white eggshells. • Eggs with speckled eggshells would be a great choice, too! Now we’ve come to the real deal – the marbling! In a few wide shallow bowls prepare the marbling color mixtures, depending again on the number of the desired colors. This mixture is usually a bit thicker than the one for the base coloring, and its color should be a bit more intense. For it you’ll need 1 to 2 cups of warm water, 1 tablespoon of olive oil and at least 20 to 30 drops of food coloring. Make sure the marbling mixture is at least 1 inch (2.5 cm.) deep. Mix gently, using the fork. In this way, the oil will form tender swirls on the surface, which will later create the ‘marble’ patterns onto the eggshells. 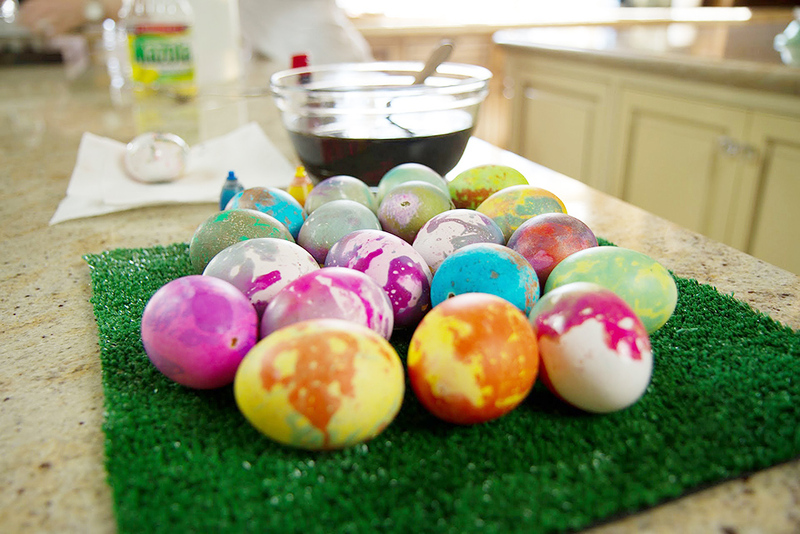 Place a dyed egg/eggshell in the mixture and roll it once around the bowl to pick up the oil streaks. Take it out, gently pet any excess of liquid off with a dry paper towel, and place it aside on a dry surface. 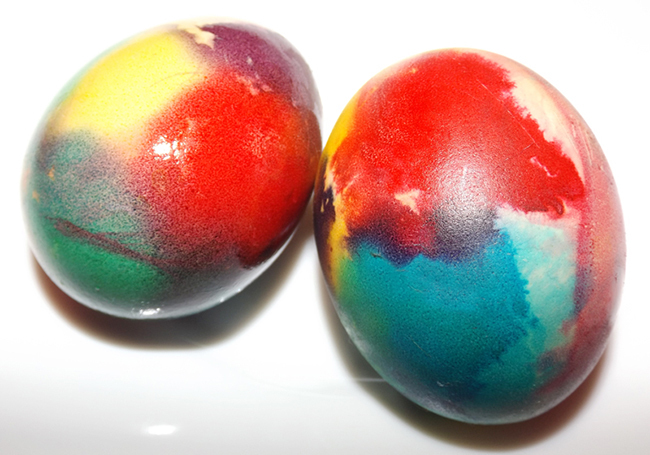 Leave the marbleized Easter eggs to dry for a couple of hours, even overnight, for getting deeper and more intense colors. • The marbling color may be contrasting to the base color or just a deeper shade of the same color of the already painted eggs/eggshells. • You can experiment with ‘marbling’ one and the same egg/eggshell by dipping it into different colors. Make sure to dry the egg slightly after taking it out of the first mixture, or leave it aside for a while to dry a bit, and then roll it into the next color mixture. You can dip in the second color either the whole egg, or only one part of it. In this way, you can get striking contrasts, subtle shadings, or multihued richness of color. • Before placing a new egg, make new swirls in the bowl. Repeat ‘Step 1’ described for the previous method. In a small mixing bowl pour 1 cup of warm water, 1 tablespoon of white vinegar and add 20-30 drops of food coloring. Make sure the color of the mixture is intense and deep. Take a piece of white cotton and spread it into a thin layer. Take an egg/eggshell and cover it with the cotton layer. Make sure you have covered with cotton the entire eggshell and that there are no holes in the cotton ‘coat’. • With this technique, the eggs/eggshells do not need to be pre-dyed in another base color. • Better use natural cotton, not synthetic. • The cotton layer should be neither too thick nor transparently thin. And here’s the fun part – the marbling! Put the protective gloves on; we’re going to get messy! Take a cotton-coated egg/eggshell, holding it gently with your fingers at the top and the bottom. With a spoon take some of one of the color mixtures and sprinkle it over the cotton ‘coat’. Repeat the same with any other of the color mixtures you have prepared. Play with colors to your desire and taste! Allow the colors to mix, merge and transfuse onto and all over the cotton ‘coat’. When the cotton is well soaked in the desired colors, tap it slightly to press it as much as possible onto the eggshell. Leave the egg aside onto carton or another hard surface and let it dry for several hours or even overnight. After the cotton has dried completely, carefully remove it from the eggshell. Voila! You have fabulously looking ‘marble’ Easter eggs! Pour a few colors of nail polish of your choice into the water. These should immediately start mixing and swirling in beautiful patterns. Make sure you add a few drops of a contrasting dark color in the mixture. Prepare as many color mixtures as you wish! Using the wooden/plastic stick, gently stir the colorful mixture to achieve “marble” patterns. Put the gloves on. Take an egg/eggshell holding it by its top and bottom tips. Dip it completely into the water, roll it gently, hold it submerged for 1-2 seconds, and then take it out. Hold it in your fingers for another couple of seconds, slightly tilting it to one or another direction to allow additional transfusion of the colors, and then place it aside on a dry carton or another hard surface. Let it dry for as long as it needs. 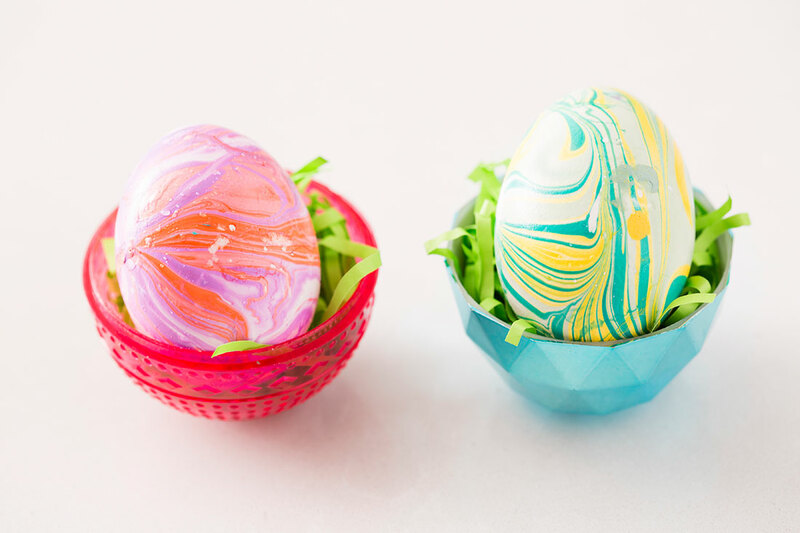 Now, here is a final tip for either of the above described marbling techniques – to give your marbleized Easter eggs beautiful shine, take a piece of soft cloth, dip it in some oil and gently smear the oil onto the eggshell. And there you are! Now you have the most amazingly beautiful marble Easter eggs and eggshell decorations to show off with! Most importantly – don’t keep all the fun for yourself! Let your kids into the kitchen or invite your best friend to join you, and then …. get messy, creative and have fun together with all those paints and colors!